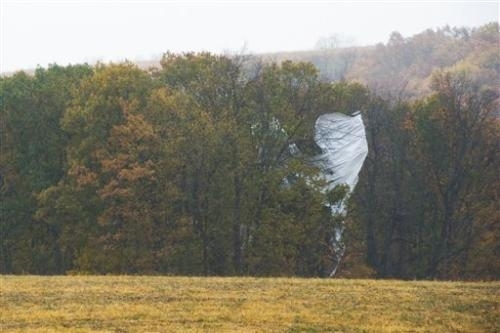 Pennsylvania State Police used shotguns to deflate the runaway Army surveillance blimp that broke loose from its mooring in Maryland and came to rest in some trees in North-central Pennsylvania. The 243-foot long craft was tethered at Aberdeen Proving Ground and came free early yesterday afternoon. It caused power outages as its tether got caught it power lines along its way. It finally landed in trees in Muncy, PA near Willamsport about 150 miles away from its moor. The main body and tail section were separated and landed a few hundred yards apart. All of the sensitive electronic equipment has been removed. It may take days or weeks to remove the whole blimp as it landed in a hard-to-access area next to a ravine with no nearby road. Investigators are still trying to determine how the aircraft got away. Delaware County honored several police today that have used Narcan to save people's lives during a heroin overdose. Pennsylvania police are authorized to use the drug which counteracts opioids' effects on a person's body. It is delivered through the nostrils. 135 lives have been saved by officers administering a dose of Narcan to people suffering an overdose on the street. There has been a rise of heroin and prescription drug use and deaths in the past few years. Delaware County set up a specific heroin task force three years ago. Those saved by Narcan still need to seek treatment for their addiction and drug abuse or they could find themselves back in the same situation.